DESCRIPTION -- Fantastic find of great interest which is from the famous old vessel the Mauretania. It is a letter opener made from the timbers of the vessel and has a plaque at the end of it saying "From the decking of the Mauretania. The old lady of the Atlantic" (click on the picture to read the inscription on the plaque). HISTORY -- Mauretania, transatlantic passenger liner of the Cunard Line, called the "Grand Old Lady of the Atlantic.â€ It was launched in 1906 and made its maiden voyage in 1907; thereafter, it held the Atlantic Blue Riband for speed until 1929, challenged only by its sister ship, the Lusitania(sunk by a German submarine on May 7, 1915). DESCRIPTION -- From the famous old vessel the iron Duke, this is a napkin ring made from the timbers of the vessel. HISTORY --HMS Iron Duke was the lead ship of a class of four battleships, and was the flagship of Admiral Sir John Jellicoe, Commander-in-Chief of the Grand Fleet at Jutland. During the battle, the ship fired 90 rounds from her 13.5-in guns, and 50 rounds from her secondary 6-in guns. Although some large-calibre German shells came close, Iron Duke suffered no damage or casualties. 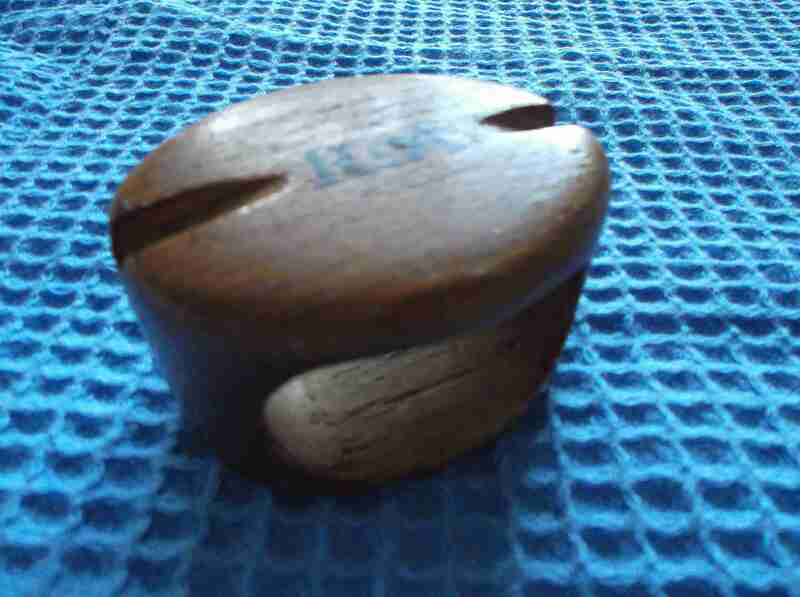 DESCRIPTION -- Very early item from the Royal Navy which is a wooden napkin holder which is dated circa 1930's/40's and a very rare find. HISTORY -- The official history of the Royal Navy began with the formal establishment of the Royal Navy as the national naval force of the Kingdom of England in 1660, following the Restoration of King Charles II to the throne. However, for more than a thousand years before that there had been English naval forces varying in type and organization. In 1707 it became the naval force of the Kingdom of Great Britain after the Union between England and Scotland which merged the English navy with the much smaller Royal Scots Navy, although the two had begun operating together from the time of the Union of the Crowns in 1603. DESCRIPTION -- Small scale model of the very infamous German Naval vessel the Bismarck which is in a great condition and the size is 7" (16cm) long (click on the picture for a close up of the model). HISTORY -- The Bismarck, probably Germany's most famous battleship in World War Two, was sunk on May 27th 1941. The Bismarck had already sunk HMS Hood before being sunk herself. For many, the end of the Hood and Bismarck symbolised the end of the time when battleships were the dominant force in naval warfare, to be replaced by submarines and aircraft carriers and the advantages these ships gave to naval commanders. DESCRIPTION -- Souvenir dining plate from the Royal Navy dated circa 1900's and is a wall hanging item with a fixed hanging clip to the back. The naval dining plate has the traditional Crown/Crest design around edge and the size is 7" (17.5cm) wide. HISTORY -- The History of the Royal Navy can be traced back to before the ninth century AD. However, the present Royal Navy was formally created as the national naval force of the Kingdom of England in 1660, following the Restoration of King Charles II to the throne. In 1707 it became the naval force of the Kingdom of Great Britain after the Union between England and Scotland which merged the English Navy with the much smaller Royal Scots Navy, although the two had begun operating together from the time of the Union of the Crowns in 1603. DESCRIPTION -- Set of 3 very old bar mats taken from an original set of 24 produced several years ago which are all in a good condition and unusual find (Click on the picture for a closer look). DESCRIPTION -- This item is an original old draft sketch of a sea-going vessel. It is a dimensions plan of a 'Kent Class' cruiser and is 21" x 8" (55cm x 20cm) in size. HISTORY -- The first Royal Navy Cruisers built within the confines of the Washington Naval Treaty of 1922, limited standard displacement for heavy (8" gun) cruisers to 10,000 tons. Compared to other powers the 10,000 ton Kents were somewhat inferior in firepower and armour, but had an unrivalled radius of action of 10,400 miles at economy speed. They were designed for overseas service in peacetime and for hunting down commerce raiders in war on the long trade routes of the distant oceans. DESCRIPTION -- Rare to find chrome match box holder which is from the Devonport Royal Naval Barracks and was designed for the 'swan vesta' size matches. It is fairly old and comes complete with match box inside and the front of the holder shows the crest and name of the Royal Naval Barracks. It is in a superb condition and the size is 3" x 2" (8cm x 5cm) (click on the picture for a close up of the crest). RECOMMENDED GREASE ACHESON COLLOIDS GRADE W.V. DESCRIPTION -- Original naval ship's surgeon's 'Postle & Morter' Bowl which is quite an old item and it is in a good condition. It shows on the side the naval 'Fouled Anchor' and the size of the bowl is 5" (13cm).